I know the title is a pretty bold statement. I mean seriously “Best Ever” but in my humble opinion this Tiramisu recipe really is!! I first had the pleasure of trying Tiramisu when I was about 18 and working as a Nanny for a family in London. 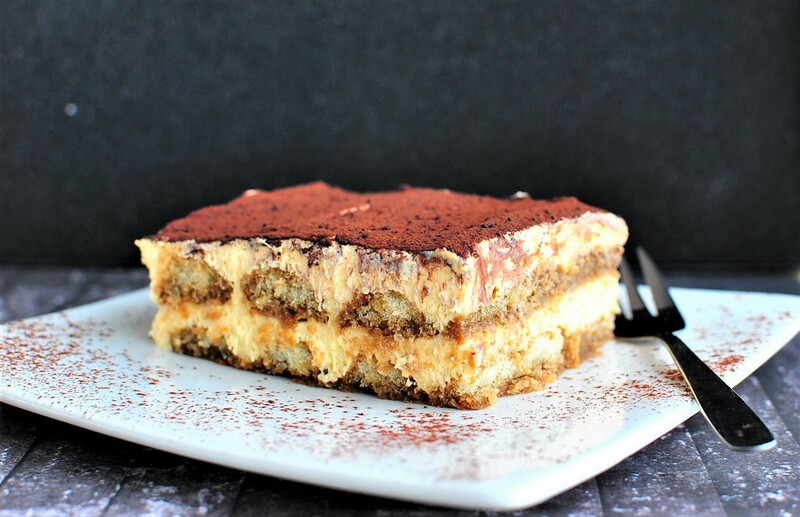 We went on holiday to a villa in the hills of Tuscany, Italy and they had a lovely lady doing the cooking for them and one day she made Tiramisu, well it was AMAZING and I was instantly in love with this creamy, velvety full of coffee and liqueur dessert. From that time on, whenever I went to a restaurant which had Tiramisu on the menu, I would always order it. However a lot of times I was sadly disappointed with the version that I was served and slowing got to the stage where I did not order it anymore and that is when I started to make it myself for special occasions, generally Christmas at which time I often consider leaving it in the fridge so that I can enjoy it for several days rather than sharing with family!! This version will not be for everyone and please don’t be put off by the amount of coffee and liqueur as it is not strong at all and if made 2 – 3 days before it is required, then all the flavors mingle and mellow and taste sensational. This may seem like a long time, but it is perfect to allow you to get on and organize other things without the last minute rush. remove from heat and allow to cool slightly. Cover and chill in refrigerator for 1 hour. Mix mascarpone into cooled yolk mixture until smooth. In a bowl, combine coffee and liqueur. sift cocoa thickly over the top layer. No Replies to "The Best Ever Tiramisu"